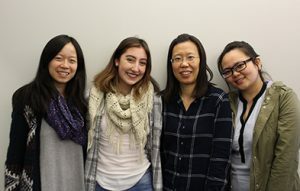 From the left are Tech Valley High School Chinese teacher Sophia Hsia, senior Sydney Hayes, Chinese IV teacher Ying Kong of the University at Albany Confucius Institute and teaching intern Yi Wang. Tech Valley High School senior Sydney Hayes of Menands recently won the Tema Bellinson Memorial Award, which is given annually to the top Capital Region high school student of Chinese language and culture. The U.S.-China Peoples Friendship Association’s Northeast New York Chapter gives out the award, and a TVHS student has won it every year for the past six years. Hayes was nominated by Chinese teacher Sophia Hsia. All TVHS students are required to take at least two years of Chinese, but Hayes has exceeded that requirement. She also traveled with TVHS for the school’s biennial trip to China in April 2015. Hayes accepted the award during a banquet on Saturday, April 29 at the Capital Buffet in Colonie. She received a scholarship and a letter of recognition from U.S. Rep. Paul Tonko, D-Amsterdam. She was cheered on by her family and Hsia at the event. The U.S.-China Peoples Friendship Association is a non-profit, tax-exempt educational organization. According to its website, its goal is to develop and strengthen friendship and understanding between the peoples of the United States and the People’s Republic of China. Founded as a national organization in 1974, it comprises four regions (East, Midwest, South and West) with more than 2,000 volunteer members in 60 affiliated chapters and organizing committees.